312 pages | 51 B/W Illus. This significant and timely volume aims to provide a focused analysis into tourist experiences that reflect their ever-increasing diversity and complexity, and their significance and meaning to tourists themselves. 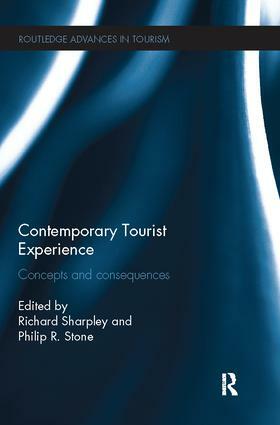 Written by leading international scholars, it offers new insight into emergent behaviours, motivations and sought meanings on the part of tourists based on five contemporary themes determined by current research activity in tourism experience:conceptualization of tourist experience; dark tourism experiences; the relationship between motivation and the contemporary tourist experience; the manner in which tourist experience can be influenced and enhanced by place; and how managers and suppliers can make a significant contribution to the tourist experience. The book critically explores these experiences from multidisciplinary perspectives and includes case studies from wide range of geographical regions. By analyzing these contemporary tourist experiences, the book will provide further understanding of the consumption of tourism. Richard Sharpley is Professor of Tourism and Development at the University of Central Lancashire, Preston, UK. Philip Stone is a former management consultant within the tourism and hospitality sector, and is presently employed as a Senior Lecturer with the University of Central Lancashire Preston, UK.